A rudimentary version of George Orwell's telescreen has been created by researchers at Germany's Fraunhofer Institute for Photonic Microsystems (IPMS). The design interlaces photodetector cells with organic light-emitting diode display pixels. The end result is a device that can display a moving image while imaging movement that is directly in front of the display. The immediate use for the device is that it could potentially revolutionize the wearable display. By tracking the eye movements of the user as he observes the display, it should be possible to use this additional data as a means of control. "We can present an image and, at the same time, track the movement of the user's eye," says Michael Scholles, business unit manager at Fraunhofer's IPMS. "This is of great interest for all kinds of applications where your hands are needed for something else, like a pilot flying an aircraft or a surgeon wanting to access vital parameters while performing a surgery." The current prototype will be demonstrated at the Society for Information Display conference in San Antonio this week. The current version touts a simple monochromatic display--about 1.25 centimeters on each side, with a resolution of 320 by 240 pixels. 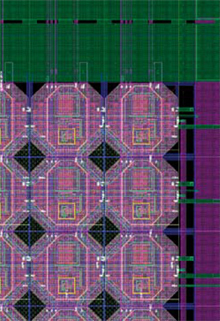 The research team has developed a 160-by-120-resolution version of the camera chip that has been tested in the lab, but not yet integrated with a display. Another key application for such a technology would be to implement George Orwell's telescreen from his 1948 novel 1984. From MIT Technology Review; thanks to an anonymous reader for passing this story along.